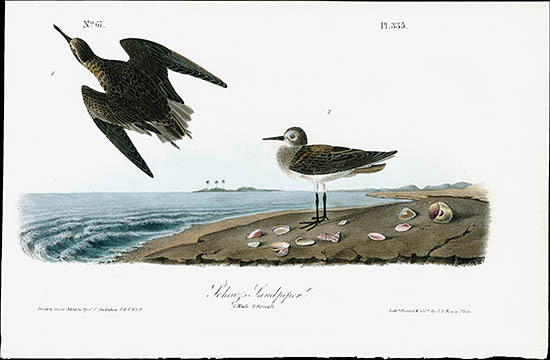 John James Audubon (1785-1851) was born in the French colony of Santa Domingo, later known as Haiti to a wealthy French sea captain & merchant and a young slave, Jeanne Rabin, who died six months after his birth. 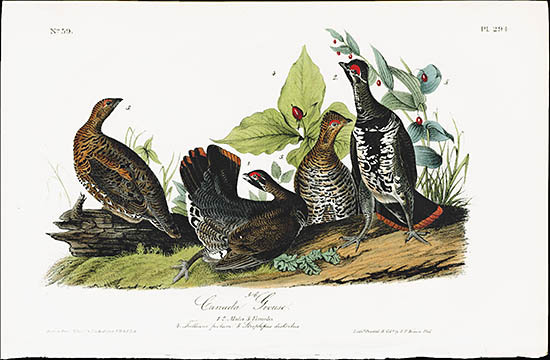 Early on, Audubon became passionately interested in nature, avoiding whenever possible the rigors of the French educational system by wandering in the countryside sketching & collecting. He was sent by his father to his plantation Mill Grove in Pennsylvania possibly to avoid conscription into Napoleon’s army. There he pursued his love of nature and collecting in a bountiful environment, to the detriment of the business of running his father’s plantation. His marriage in 1808 to Lucy Blackwell, an English woman and neighbor, added stability to his life. 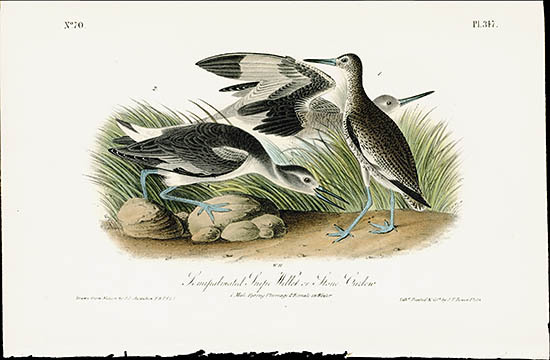 For over ten years, the family lived in Kentucky where Audubon was a frontier shopkeeper, while continuing to pursue his avocation of naturalist & artist. While there, Lucy gave birth to two sons, Victor Gifford and John Woodhouse, as well as a daughter who died in infancy. 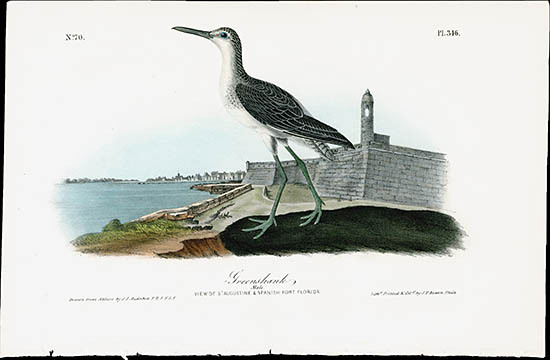 Audubon was quite successful in business for a while, but hard times hit, and in 1819 he was briefly jailed for bankruptcy. 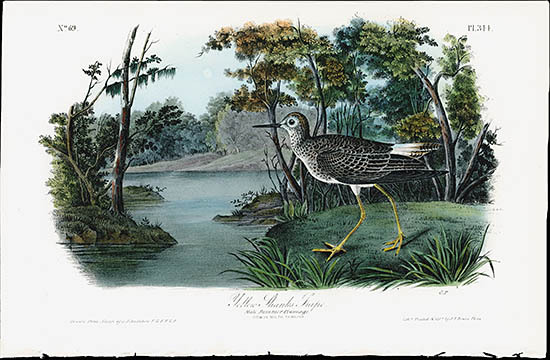 In the absence of other opportunities, Audubon launched on the life of backwoodsman, naturalist & adventurer in the south, while Lucy supported them by working as a governess. 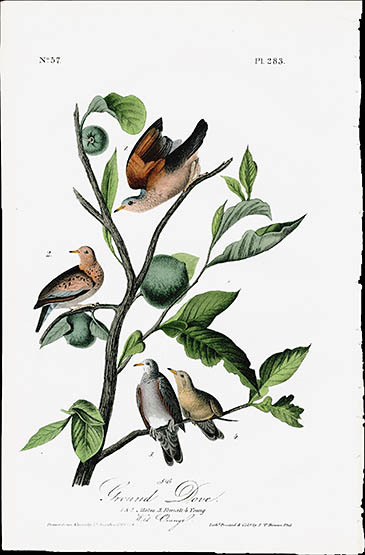 Lucy survived both her husband and sons, selling off the copper plates for The Birds of America late on in life for their value as scrap metal. Fortunately, many were rescued. 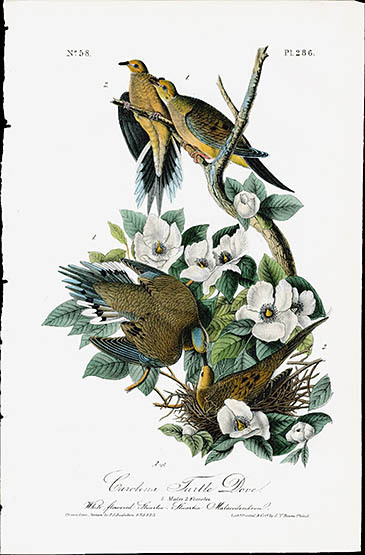 Audubon worked on the monumental Birds of America from 1827-1838, illustrating & editing one of the largest & most expensive bird books in the world. He used the finest of specimens, and all types of media including oil crayon, pastel watercolors, ink & gouache to stunning effect. 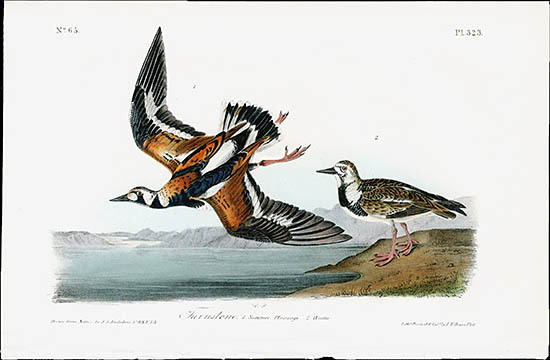 His genius was in his intimate knowledge of the world of birds & their surroundings gained from a lifetime of observation in the field, and the ability to translate this vision into a publication that has never been equaled in the world of ornithology. 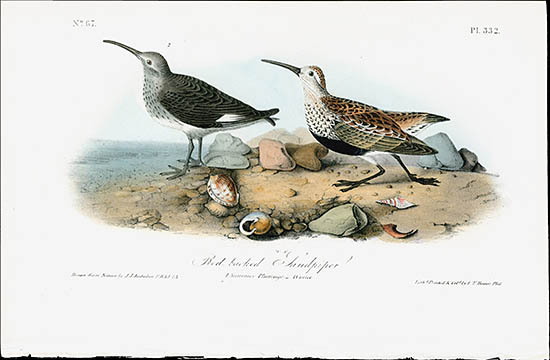 Audubon also applied his methodology and artistry to create a record of the Native American mammals. 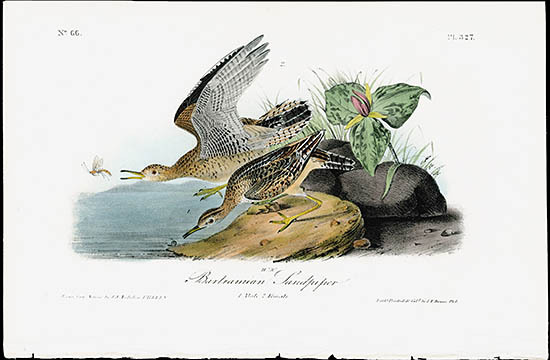 The Quadrupeds of North America, which became an immediate success on publication, illustrated many frontier mammals never before seen or depicted. 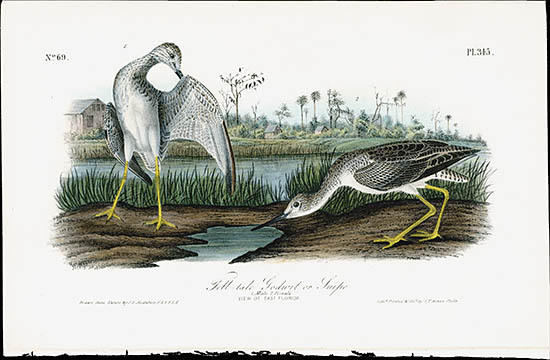 Sadly, Audubon died before the publication of the octavo edition of the Quadrupeds which was completed by his son, John Woodhouse Audubon. 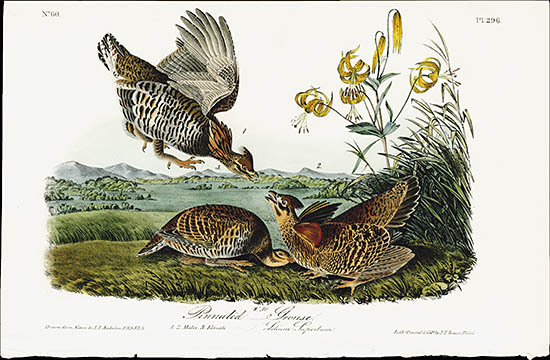 The legacy of Audubon to the world was in these two superb works on American Birds & Quadrupeds which have come to signify a love of all wild creatures & the environment, epitomized today by the Audubon Society, & immortalized world wide in publications and the stamps of over 60 countries. 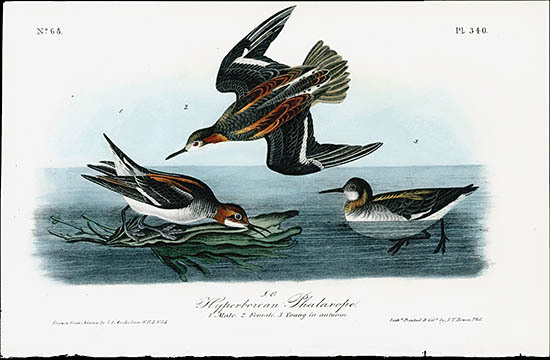 In the words of the Audubon Society, perhaps above all else, Audubon was a lover and observer of birds and nature. 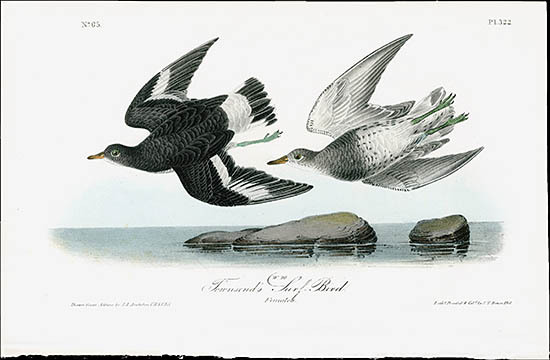 We are offering a selection of prints from the scarce and sought after original first octavo edition of Birds of America published in Philadelphia from 1840-1844. With lithography by J.T. 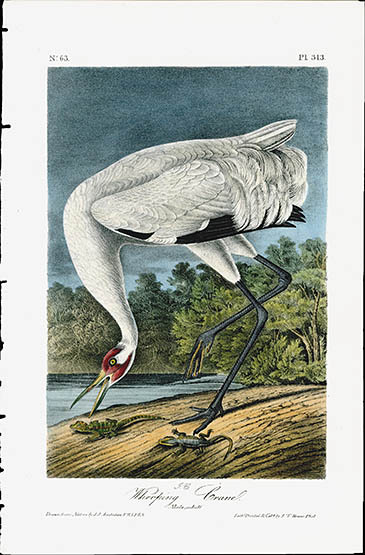 Bowen, this is the only edition that is entirely hand coloured. The hand colouring in this set is very vibrant and fresh. 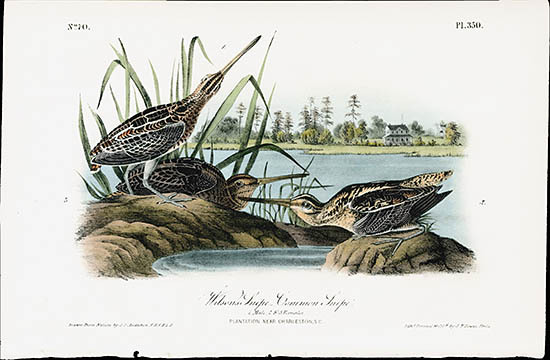 Each print is in excellent entirely original condition on strong light creamy paper, with gilded edges, measuring approximately 6 1/2" by 10". The prints have been carefully detached from the binding remnants to preserve the entire margin, as shown in the image. A few prints have some very faint text offset or slight foxing. The text pages are included and when overlapped, have been carefully copied. 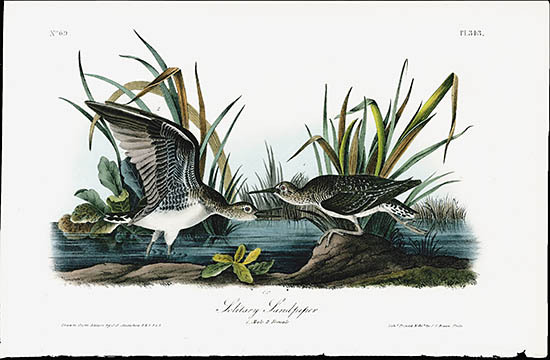 A complete edition of this beautiful and extremely scarce work sells for as much as $95,000, so these prints are definitely a great investment, as well as objects of great beauty.